On my birthday recently my wife and I decided to do something a little different, careful, it is not that kind of an article although it does involve me and another bird with two lovely breasts. We decided, a few months in advance, to visit the Northern Shooting Show that was being held for the second year in Harrogate (the posh part of Yorkshire). So an a reasonable if chilly birthday Sunday morning we folded back the roof of the car and sped off on our jolly. I had watched a few promotional videos on Youtube and had a fair idea what to expect, remember guns are not as much part of British culture as they are in the USA. The last time I had regularly fired weapons was a long time ago as an infantry soldier in the Territorial Army, the Yorkshire Volunteers, well apart from shooting the odd rat or beer can in the back garden with my air rifle that is, I was in the regimental shooting team back then. Anyway the first thing I did was have a go with an AR15 .22 on a portable range and my wife had a go with a Beretta and we both got good groupings. We then had a saunter round the outdoor stalls, watched a bit of the air rifle shooting competition, watched the retrievers being put through their paces in a competition that looked a lot of fun, the we went into the big exhibition halls as the sun was refusing to come out and it was pretty cool. Here we found masses of interesting things to look at and to play with, I even bought 3 really neat little knives for a mere £5. At the back of one of the halls was a bushcraft area and this was on my list of key things to visit. 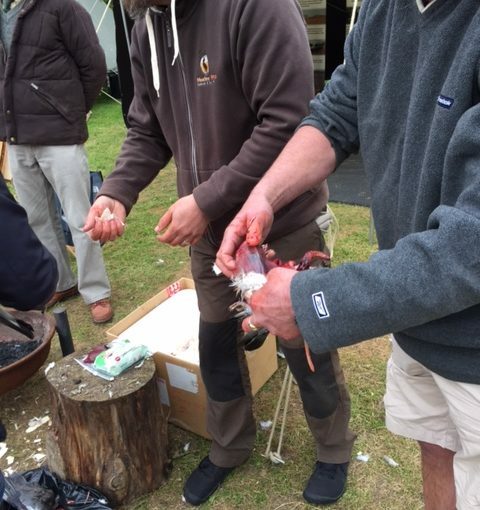 We really enjoyed the ferreting display with Mark Davies, this was really entertaining and educational in equal measure and my wife got to hold a cute baby ferret……. The next stall was a guy who was showing people how to field dress game for the pot, we got their when he was dressing a pigeon, by hand. So we watched as showed us how to assess if the bird was healthy, he removed the wings, then the head, cleaned out the crop, then he inserted his thumbs, one at a time down into the body, the first along the back bone, then the second along thr breast bone, then with both thumbs slid back in place he spilt the bird open. This exposed the breasts and he then showed us how to remove the breasts using the thumbs. Hey presto two lovely pigeon breasts ready to cook. I had never seen this done before, virtually everything we eat comes from a shop, the meat from a local butcher or preprerared from the supermarket. I had prepared pigeon years ago with a knife but it was messy, this was easier and less mess, I was impressed. He then asked for volunteers to try this on two more pigeons, step forward one willing volunteer and I was joined a minute later, after some persuasion, by a woman who had been watching too. So I paunched my first wood pigeon, yes there was blood and giblets but I successfully retrieved the breasts, no tools needed, not even my nice sharp little knives. So after washing the blood off my hands I was quite pleased with myself. I had tried something new and got it right, nothing life changing but it told me a little more about myself. I have a great love of the outdoors, I never fail to be please when surrounded by flaura and fauna, I have no wish to kill or harm anything unless I am going to eat it and like most people hat is done for me virtually all the time. The moral of this tale, and a major part of my upcoming book, Exit the Dojo, (teaser), is that we are increasingly, and to our cost, detached from nature and the natural world. I do grow some food, vegetables and fruit and my grandchildren learn where food comes from. I have one daughter who is vegan and another who is vegetarian, the latter ones children eat meat. We need to see where our meat comes from. Toby Cowern is the CRGI survival expert, mine is an interest that grows out of my use of the countryside, its mountains, lakes and woodlands, the wild moors in all the weathers our temperate climate provides. Would I kill and eat a rabbit, a sheep, a cow? Yes I would and I would want to know that every bit of that animal that could be used would. In my predominantly white western consumer orientated society, living in a country of shopkeepers as Napolean, once said, we are alienated from nature, we need to return to older ways occasionally to get in touch with our species being, the experience of the last 50 generations has not wiped out what was learned from the previous 5,000 generations, we are tool users, but before we had tools the opposable thumb set us apart for our hominid cousins, and incorporating meat into our diet fuelled the massive growth of the brain. Paunching a pigeon is a primal act, we need to recognise and learn to love the primal in us. Previous Previous post: Book Review – ‘Smarter Faster Better: The Secrets of Being Productive’ by Charles Duhigg.